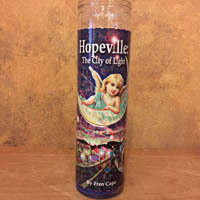 Johnny Rizzo has created these beautiful candles to celebrate the spirit of Hopeville. Lovely custom artwork plus a prayer by Fran Capo. 12 inches tall, $20 plus $7 shipping & handling. Order an AUTOGRAPHED SOFTCOVER EDITION with FREE inspirational bookmark only $9.95 plus shipping! HOPEVILLE CD NOW AVAILABLE. Read & Performed by the Author. Only $20 + $7 shipping. 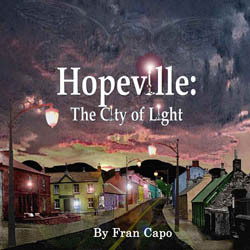 "Fran Capo's HOPEVILLE: The City of Light is a heart warming and inspiring story for all ages. 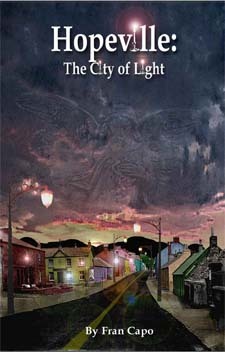 After reading Fran's tale, everyone will wish they too lived there." I hope the world embraces it. I love it. As a fourth stage cancer survivor I learned how precious life is. I practice everyday the art of gratitude and giving with my Comedy Cures Foundation. This book teaches you through parable how to give, how to love, how to follow your dreams. It’s a simple beautiful book that was given to Fran from above. I hope the world embraces it. I love it. I've been following a spiritual path and meditating for more than 30 years, and I want to thank you because after reading Hopeville, I felt so inspired and so full of joy. It made me want to live in my heart, connect with the Divine who lives within us all, brighten my inner flame and go out and do good things for people. And that was after reading just the first chapter! Your story is a brilliant reminder that true happiness comes from within and that we all belong to one big family. I pray that millions of others in our world family will read your book so they can get the same inspiration that I did. Hopeville is the next Alchemist! Hopeville delivers hope and inspiration!